82% of customers who have a bad experience never come back. Even worse, a bad experience in person often translates into a negative review online. So, how do you find out if your customers are happy? How do you convert unhappy customers into fans? A Customer Feedback Kiosk is a powerful tool for gathering insights into your customers’ satisfaction levels and overall experience. As a business you can use this tool to convert customers into fans by having the insights you need to create a better experience. Note: this guide was written for Pro and Premium Plans only. If you’re using an Individual Plan we recommend you upgrade your plan level. Don’t have an account? Try us for FREE! Click here to sign up for a free trial. Ready to take your first step towards measuring customer happiness? This chapter will walk you through best practices to build and launch your Customer Feedback Survey in minutes. We recommend using one of our Customer Feedback Templates (browse the full library here). Templates are a great way to get started quickly and are already built with best practices in mind. Alternatively you can decide to start from scratch. To do so, select “Face to Face” as your survey type. If you’re starting from scratch, we also recommend sketching out what you want your survey flow to look like. 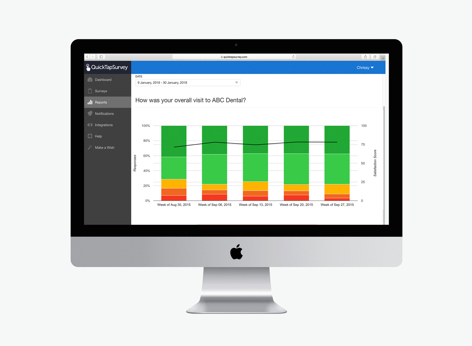 Our platform features question types designed for capturing customer feedback. You can easily add or edit questions using our drag and drop builder. Here are the questions that we recommend including in your customer feedback survey. Tip: Try to keep your survey to five to seven questions to increase your response rate. Select one of these question types depending on the type of customer feedback you’re looking to capture. Tip: If you’re unsure, we recommend using our most popular option “Satisfaction Rating”. 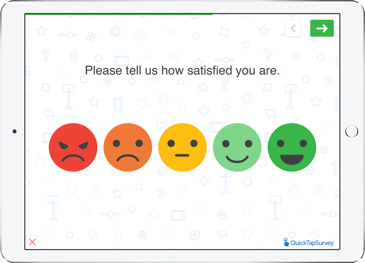 Measuring customer satisfaction Provides you with a customer satisfaction score using smiley faces. Can be on a scale of 5, 4, 3, or 2. Provides a star rating Provides you with a star rating out of 3, 4, 5, 6, 7, 8, 9, or 10. Provides a rating on a custom scale Provides you with a rating on a custom scale. Measuring customer loyalty Provides you with an NPS® score. In addition to capturing feedback, you’ll want to capture follow up details using the following question types. 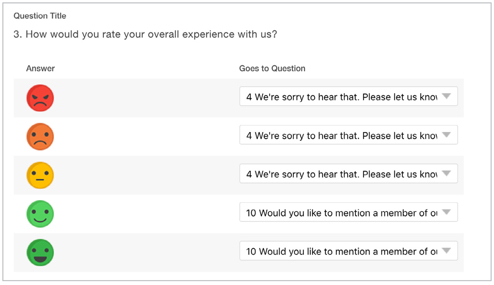 You can easily change the fonts, background, colors, and logo for your customer feedback survey. These are optional. Some people like to jump right into the survey. Tip: Add a giveaway for your product or service to boost your response rate and promote it using the start screen. For the end screen make sure to include expected next steps. Depending on if your customers are happy or not, you’ll likely want to capture different data points for follow up. Here are some additional survey settings we recommend enabling for your customer feedback survey. 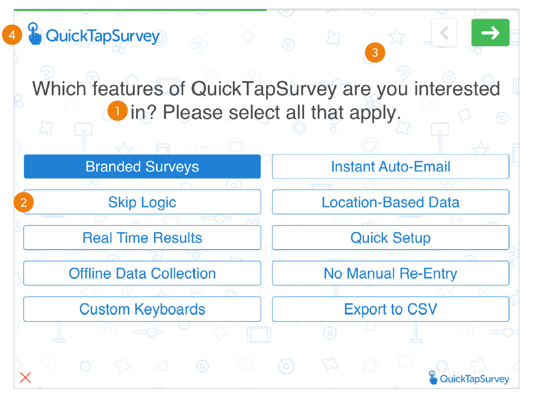 Enabling this will have your survey automatically start again from the beginning once completed. Adding an exit code will prevent respondents from exiting the survey unless they know the code. Your survey will automatically restart if it has been abandoned beyond a specified amount of time. 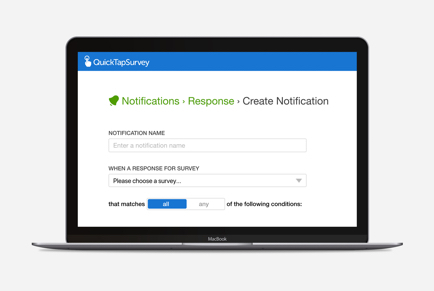 Open up the QuickTapSurvey app on your tablet and login to your account. Tap “Sync” to download the survey you just created. Go through your survey to test for design and flow. Tip: Give your survey to someone else and watch them complete the survey unassisted to see if there are any friction points. Afterwards ask them for feedback. Publish your survey to push it live! Once published, login to the mobile app and press “Sync” to download your newly published customer feedback survey. When setting up a kiosk, there are specific things you’ll want to consider since customers will be completing the survey unassisted. 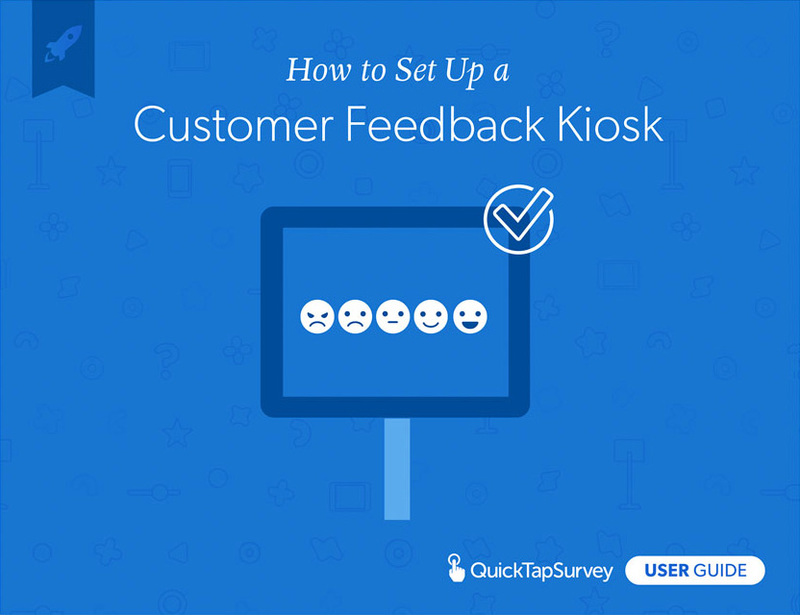 Here is our checklist to transform your tablet into a customer feedback kiosk. Within your tablet’s settings make sure to maximize the brightness of your screen. Disable auto-lock on your device so that the device won’t automatically go to sleep due to inactivity. Block the user from pressing any buttons within your kiosk enclosure. If you’re using an iPad you can disable the home button and do not need to block it. Set up an email notification that lets you know when one of your kiosks is offline. You’ll be instantly emailed when one of your kiosks fails due to loss of power or system issues. Note: this feature is for Premium Plan users only. Within your account, you can also check to see which of your kiosks are currently active. This is a great way to manage kiosks at multiple locations. If you’re capturing customer feedback from multiple locations, we recommend setting up each location as a user so that you can easily segment your data by location later. How you follow-up on customer feedback is just as important as capturing the feedback in the first place. Whether your customers are happy or not there is always additional value to be gained, whether it’s generating more five star reviews or getting in touch with unhappy customers to convert them into fans. Here’s how to automatically trigger internal and external follow-up based on the customer feedback data you’ve collected. Send an email alert internally based on the customer’s feedback. To set up an internal alert, you’ll need to create a response notification. Note: this feature is for Premium Plan accounts only. You can customize the content of the email to include response details using question piping. Based on the customer feedback you capture, you can also trigger an auto-reply email to your customer. You can also customize this content using question piping. Note: this feature is for Premium Plan accounts only. Alternatively, you can also trigger emails using your own email marketing tool by syncing the customer feedback data you’ve collected directly using one of our integrations. Note: Integrations are only available for Pro and Premium Plans. Now that you’ve started to collect data - it’s time to analyze your data to gain insights. Here are some key reports you can utilize. Note that certain reports are only available depending on the type of questions you ask. Tip: Want to receive reports instantly in your inbox? Set up a scheduled report by clicking “Reports” and then “Scheduled Reports” and selecting the report you’d like, the frequency, and where you’d like it sent. This report is a great snapshot of how happy your customers are. You can also filter this report by location using the user filter. This will provide you with an overview of all data collected within the survey. All data is represented using pie charts, bar chart or tables depending on the question type. This report is a great look at all of the data you have collected. This report is a great NPS® snapshot for your business. You can also filter this report by location using the user filter. If you don’t already have a tablet here’s our purchasing guide. The first decision you’ll need to make is choosing between an iPad or an Android Tablet. If you don’t already have an enclosure you can easily purchase one online. There are literally hundreds of options to choose from which vary both in price and customization. We recommend using Lilitab Kiosks. We recommend browsing your options on Amazon. Now that your customer satisfaction survey kiosk is live here are some additional best practices to help you collect insights. Make sure your kiosk is visible - You want to make sure your clients are able to access the kiosk; Putting it in a high traffic location or a place where your clients may be waiting gives them an opportunity to voice their opinion. Think waiting room, entrance/exit, checkout, or reception area. Keep your survey on brand - People want to be assured that the information being provided is going to the right people; Having your own branding or logo on the survey will give people that assurance. Tip: You can customize the branding, add a logo or an engaging start-screen to any survey. Keep it short - Survey engagement drops with every question so make sure to only ask for the insights you are looking to act on. You can always follow up with individual respondents if you are looking to get more information from them. Incentivize participation - Add a giveaway for those that provide feedback tied to your services. By adding a small incentive to the start of the survey, you will increase survey participation. Send out an online survey as a follow-up - Once you’ve actioned the data, email out an online survey to your respondents to find how your actions have impacted your customers.